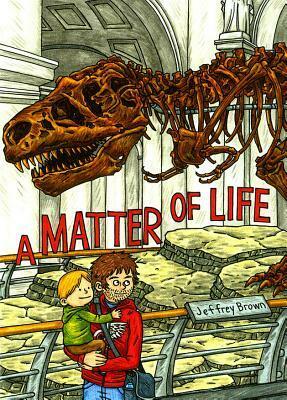 A Matter of Life is part of the growing comic-book memoir genre–think Persepolis, Fun Home, and Blankets. I was going to pass this one by when the comic shop guy personally recommended it. Every so often I wonder if he even reads comics any more. But he’d read this and liked it, so I got it. You may recognize Brown’s art from the wildly popular Darth Vader and Son, which my own sons love, and we’ve shared with many others as gifts. It has a sweet sensibility that combines the love and frustration of parenting with the imagined interactions of Darth Vader and a little Luke Skywalker. There’s now a sequel, Vader’s Little Princess. But prior to these hits, Brown was known as a comic-book memoirist, and A Matter of Life is in that vein. In short visual stories, we see shots of life, past and present, with Brown’s father and then his son, and all three of them together. As the son of a minister, he declared himself an atheist in his teens and made everyone uncomfortable. Then, when he becomes a father, how does he explain the universe to his son Oscar, without lying, but also without disrespecting the people he loves? It’s a deceptive book–short, easy to read, often sweet and funny, but with topics as weighted and fraught with mystery and history as the dinosaur skeletons on the cover. The hardcover edition is pleasingly sized with quality paper, typical of publisher Top Shelf’s fare. Being a child, being a parent, struggling to articulate what he believes–Brown’s struggles resonated with me a great deal. See also: “Exploring a Crisis of Faith with Confessional Comics” at NPR. This year, thanks to my summer reading project of Shelf Discovery related books, I read nearly 100 books, and finish the year in the middle of three chunksters. Since we’re on winter break, and the kids are here, and they are, no joke, running around chanting “nyah, nyah, you can’t hit me,” I’ll keep this short. Thumping Good Reads: Lonesome Dove, Both Ways is the Only Way I Want It, After the Apocalypse, Art of Fielding, Wild, Tragedy of Arthur, Thousand Autumns of Jacob de Zoet, Silver Linings Playbook, Devil in Silver, and Turn of Mind. For one of my book groups, Turn of Mind by Alice LaPlante wasn’t at all what I was expecting. When I heard it was a book about a woman with dementia, I imagined a Lifetime movie. Instead, it’s something else entirely. The main character, Jennifer White, is a retired hand surgeon whose dementia is getting worse. Her best friend was recently murdered, and she’s the prime suspect. Unfortunately, she’s not a reliable narrator, and this book plays skillfully with that, telling us parts of her past and present as she goes, filling in the big picture a little at a time. I was very worried that the end wouldn’t pan out. This is the kind of thriller that depends very much on the strength of its Ta Da moment at the end. I think the author mostly pulled it off. There were some implausibilities that nagged, but it was largely satisfying. It engaged me from beginning to end, and I found the main character fascinating. I started Tiny Beautiful Things: Advice on Love and Life from Dear Sugar by Cheryl Strayed, before I read Strayed’s more famous Wild. It’s a collection of the previously anonymously penned advice column at literary site The Rumpus. It is a very different book, but with many similarities and connections. As in Wild, Strayed puts a lot of herself and her troubled past on the page. But she doesn’t tell the exact same stories, in the same ways. Here, she uses them in service of telling people who ask her for help what she thinks. This is not a story, with a beginning middle and end. It worked well for me as a pick it up then put it down book, read in bits in between other things. It might make an excellent book for the bathroom, which seems a weird descriptor, yet an apt one, I bet for those who know what I mean. I really enjoyed reading the columns, and reading Strayed’s responses. A few weeks ago, I read Savage Love, and didn’t like a response that Dan Savage gave a reader. “Sugar would never have told her to do that!” I thought, outraged. Throughout, Sugar is like someone who listens well, really tries to understand what’s being said (and as often, what’s not) and who exhorts the writers, and all the readers, too, to work to reach their highest, best selves, with acknowledgement of how hard that really is. I got to see Strayed in person recently, where she also offered her writing advice like this: “Write like a mother [cuss]er.” Which is funny, but it’s also true. That’s sorta how I felt about the book. It’s a good companion to Wild if you liked that, but probably not if you didn’t. Raina Telgemeier’s Drama is a graphic novel about Callie, a middle-school theater geek. She has a crush on one boy, while another one likes her, and makes friends with some others as they prepare for the school play. There’s kissing, but not much more, so the story feels sweet and young. It has an openness about gay teens that reminded me of the wishful fantasy of Boy Meets Boy. The art is charming, Callie is engaging if sometimes annoying. It’s a likeable book that I found myself wishing I liked more. I just didn’t connect–maybe because I was not a drama person? This story picks up in series continuity just after the Fables defeated the armies of the Emperor. We’ve got Ali Baba, a bottle imp (not a djinn, sorry! ), the Snow Queen and Sleeping Beauty. There are fights, there’s romance and things don’t quite have a fairy-tale ending, which I appreciated. In addition, Fairest: Wide Awake is capped by a one-shot story about Beauty and the Beast, with a surprising reveal about their history. As with the best of the Fables series, Fairest is a fun, fast read, that plays around with storytelling and mythologies in interesting ways. The Silver Lining Playbook by Matthew Quick has been on my shelf for years, a gift from my Eagles-fanatic stepfather-in-law to my Eagles-fanatic husband when it was released, and pulled off the shelf by me because it’s currently playing on the big screen. Quick’s novel is eminently readable, an entry in the emotionally-stunted-young-man-stumbles-toward-some-kind-of-understanding genre. In this it strongly reminded me of Jonathan Tropper’s This is Where I Leave You. Pat is a guy in his 30’s, just released from a mental institution, and he’s pining for his wife Nikki, that everyone else, including the reader knows, is his ex-wife. He’s got an emotionally stunted dad whose moods are dependent on whether the Eagles win or lose. (I’m married to an Eagles fan, so I really appreciated the ethnography of this particular subculture as I recognized many aspects.) 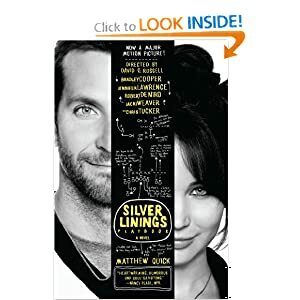 Pat thinks life plays out like a movie, where every bad thing always has a silver lining, so much of the book reads like the film it’s been “adapted” into, rife with coincidence, but still has some surprises. Alas, one of the reveals near the end about Tiffany, the emotionally damaged woman Pat has befriends, continues to nag at me. Two aspects of it read like really creepy male-fantasy masquerading as characterization, and this left it ending on a sour note for me. 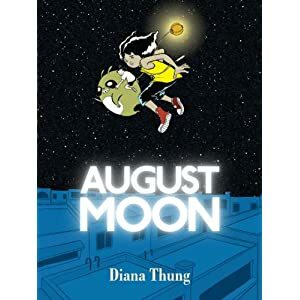 August Moon by Diana Thung is a children’s graphic novel heavily influenced by Hayao Miyazaki’s films in general and My Neighbor Totoro in particular, though it’s rather like Princess Mononoke crossed with the latter, as there are bad guys with guns. There’s also a little bit of Seuss’ The Lorax. It’s cute and sweet and has likeable child protagonists in Jaden and Fi, but I found it hard to read visually at times. For example, there would be multiple panels of a character facing different directions when they were only supposed to be moving in one direction–this was disorienting. My difficulty could also be a factor of many small panels per page. My 9yo son Drake read this and really enjoyed it. He has much sharper eyes than I do. 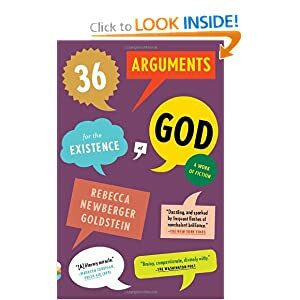 Just so we’re clear, Rebecca Newberger Goldstein’s book 36 Arguments for the Existence of God is a work of fiction. And yet, it’s kinda not. As they say, it’s complicated. Or, as my professor of Judaism in grad school used to say in the type of grad-school lingo often parodied it Goldstein’s book, “it’s not UNcomplicated.” Thus, whether you like it or not (and my book group found it pretty divisive), you probably won’t find it UNinteresting. Goldstein has a background in philosophy and mathematics, and was raised as an Orthodox Jew. All these aspects and more are woven through the novel. She has written both fiction and non-fiction, and her philosophy colleagues tend to view her fiction forays with suspicion, as she notes in this weird book trailer where her husband, the cognitive psychologist Steve Pinker, talks with her about it, yet never identifies her as his spouse. It also features a lot of stilted shots of Goldstein on a ladder in their impressive library. As I said, weird. It’s a 400+ page novel with a 60-page appendix that contains the 36 arguments of the title. I found the appendix and the parts of the book that were very philosophically argumentative less interesting, and the morality tale of the characters involving and fascinating. Some readers in my book group reacted negatively to the esoteric verbiage of the overtly philosophical sections. As one noted jokingly, it made her feel “stoopid.” Others reacted to how lengthy these sections were, and noted they tended to drag, especially as compared to the novel, featuring a religion professor named Cass Seltzer. I’ve gone on here, and haven’t even gotten to main parts of the story and other characters. It’s an interesting satire of academia, and of new atheists. It fictionally presents the question whether there’s any point in trying to prove the existence of God. My advice on reading, if you think this sounds interesting: read the novel, then the appendix, and skim the parts that you find slow, since the narrative wanders and does not have consistent momentum. And yet, I do recommend it. It made me think, and still has me thinking. The Thousand Autumns of Jacob de Zoet by David Mitchell. Made me laugh. Made me cry. Had me utterly involved over the course of reading it. Didn’t want to leave the world and these characters. A smashing historical novel. Perhaps one of the best books I’ve ever read. Oh, I’m sorry, did you want a little more than that? All right, all right. The book opens, not on the main character, but with a midwife attending a complicated birth. Then, in 1799 by the Western calendar, a young Dutch clerk named Jacob de Zoet goes to Dejima, the trade outpost of the Dutch on the coast of Japan. He’s there along with his patron to uncover just how corrupt the former Dutch representatives were. After a chance meeting with a woman over a monkey that’s absconded with a severed human foot, things get really complicated. And that’s just in section one, before things go really crazy in section two. This book has history, trade, Japan, interpreters, romance, evil kidnappers, and dozens of characters, many of whom get to narrate. Deeply satisfying, and highly recommended. Are you sitting down? Because The Tragedy of Arthur by author Arthur Phillips, is a little complicated. It’s a novel, but one that deliberately blurs the line of reality, being narrated by the character of Arthur Phillips, an author of such books as Prague and The Song is You, just like the real life Arthur Phillips. Random House is proud to present this first modern edition of The Tragedy of Arthur by William Shakespeare. that general readers plunge directly into the play, allowing Shakespeare to speak for himself, at least at first. then, if some background is helpful, look to this very personal Introduction. Before I began the book, I knew it had to do with a play within a novel and that it was convoluted and intertwined. OK, I thought, after I read the “Preface,” what to do now? Treat it as a novel, and read the “Introduction” of 256 pages, or do what I normally do when approaching a play or classic, read the work first, then backtrack to the introduction to avoid spoilers? I tried the play first, then a friend told me to have some sense already and just read the novel. Having attempted both, I can attest that reading the “Introduction” first is the way to go. Arthur Phillips, the narrator and main character (and possibly also the author?) launches into a long family history interspersed with token summaries of the play that follows, purported to be a previously undiscovered work by Shakespeare. As we learn over the course of the tormented, self-aware, memoir-ish “Introduction”, the play–The Tragedy of Arthur, about King Arthur’s short reign–may have been forged by his father, also named Arthur. Got it? Her complete project was a strange and beautiful hybrid of historical research, literary interpretation, parody, and outright fiction. A few thoughts, out of joint: the character of Arthur’s twin, Dana, reminded me strongly of Cassie from the Tana French novels In the Woods and The Likeness and the twins’ relationship is very like that of Cassie and Rob from In the Woods. I was also reminded strongly of The Family Fang, with its wacky family of four, and brother and sister who try to puzzle out the truth from the lies of their performative parents. It also reminded me of the Thursday Next novels of Jasper Fforde, in the playful/respectful manner in which it worked with the origin material. Yet this novel, with derivation at its heart, and that reminded me of several others, continued to amaze me with its originality and wit. There will be a video chat with the author at the 11/13 meeting of Books and Bars, which I very much look forward to. Hey, everyone, my friend Amy at New Century Reading is doing a readalong of Bleak House by Dickens, using the same chapters he did when he wrote it, so one serial section a week, which is about 50 pages or so. I started a readalong earlier this year and didn’t love it though I did love Bleak House, and am excited to give it another go. As much mud in the streets, as if the waters had but newly retired from the face of the earth, and it would not be wonderful to meet a Megalosaurus, forty feet long or so, waddling like an elephantine lizard up Holborn Hill. Smoke lowering down from chimney-pots, making a soft black drizzle, with flecks of soot in it as big as full-grown snowflakes–gone into mourning, one might imagine, for the death of the sun. There’s an endless court case, a mysterious orphan, a crazy old lady, a beautiful woman with a past… Oh, I look forward to finding out more! A selection for my book group that discussed books about myth or religion, Nothing to Be Frightened of by Julian Barnes was the first non fiction pick of our almost two-year-old group. Several members had requested non-fiction, which those of you who read this blog know isn’t always my cuppa. Push comes to shove, I don’t think any non-fiction books are going into my apocalypse backpack for the end of the world. Perhaps Apocalypse Backpack will be my band name. Anyhoo. Since the group focuses of books of myth and religion, I’d been considering some of the new atheists like Dawkins or Hitchens. But they seemed so strident, and so “you’re dumb if you believe” that I wanted something a little more, well, moderate. And while I got that in the Barnes, which is his non-fiction meditation on death and dying from an agnostic or atheist point of view, I ended up wishing for a bit more stridency. But more on that in a bit. This paragraph is a perfect introduction to the book. It’s dryly funny, self-deprecating, and it introduces Barnes’ older brother Jonathan, a frequent sounding board in the book. Barnes relates details from historical philosophers and writers about death, and quotes friends of his. (Anyone who can identify who his friends Professor S and C are? A Guardian review made it sound as if it were obvious, but even my two most Barnesian friends didn’t know.) He relates stories from his past and from his family’s past to demonstrate the shifting nature of memory and narrative. He cops to being afraid of death and nothing (hence the pun in the title, which I appreciated) and being forgotten. It’s well written. It’s clever. But it doesn’t tell a narrative–Barnes doesn’t finish the book in a different mind than he started it, at least in my reading. And he spirals in and out of stories and reminiscences, adding bits as he goes, which is skillfully done, yet felt repetitive. Finally, several in our group wished he’d shared more of himself, and been a little less chilly and distant, a little more strident if you will, to use the adjective from above. And yet, thinking on this later, given the childhood and family Barnes describes in the book, I’d say that this intelligent book is about as honest and disclosing and warm (i.e. not very) as can be expected, perhaps even more. This book was also interesting to read close in time to his novel Sense of an Ending. There is at least one character in there created from reality, and the themes of memory and death are continuations of what is here. One final question. His book is dedicated to P, most likely his late wife, Patricia Kavanaugh who died of a brain tumor in October of 2008, while this book was published in March of that year. She is mentioned just once, in passing, in the entire book. Was Barnes aware of her tumor, and her impending death while writing this, a further example of his reluctance to actually inhabit his own exploration? The Unwritten: Tommy Taylor and the War of Words is the sixth collection of the excellent ongoing Vertigo comic-book series about a man named Tom Taylor who learns he may be the incarnation of his father’s famous fictional creation, a very Harry Potter-esque boy magician named Tommy Taylor. In this collection, stuff happens. A LOT of stuff happens. We get some answers finally, actually, rather a lot of them. There are laugh-out loud funny lines, and the pleasing sense of many storylines converging, and finishing while a new start is made. Overall, this was a very entertaining segment of this engaging ongoing series about stories, literature, and a grown-up boy magician. The Manhattan Projects (yes, it’s plural) by Jonathan Hickman is a graphic-novel collection of the first issues of the Image comic book series. It’s an alternate history of famous scientists like Einstein, Oppenheimer and Feynman, with sci-fi and horror. The story reminds me of Warren Ellis and Planetary, but it’s a little less gratuitously violent, while Nick Pitarra’s art recalls Frank Quitely’s. If you’re a science nerd who can stomach horror, then you’ll like this. It is a good teen romance, one between Paul and new-guy Noah. They meet in a bookstore that’s having a concert and dance, so right away we know we’re in some kind of gay-friendly alternate universe, in a New Jersey suburb of NYC. And the romance follows the usual trajectory: Boy meets boy in a cute manner, then loses boy, then gets boy back. Other people’s romances orbit around them and comic relief frequently intervenes in the person of Infinite Darlene, fka Daryl, who is both the star quarterback and the homecoming queen. But it’s not all sunshine and flowers. Paul’s friend Joni is dating a new guy the old friends don’t like, and Tony’s gay-unfriendly parents are slowly crushing his spirit. This is a short, lovely book, though I enjoyed it more at the beginning, when it focused on the open nature of the fictional school, than towards the end, when things played out mostly predictably. This book reminded me fondly of Francesca Lia Block’s Weetzie Bat books, in how magical and wonderful and weird yet true it was. Highly recommended. I got in a grocery checkout-line convo with a guy who said he wanted to move to Portland. I recommended he read Wild: From Lost to Found on the Pacific Coast Trail, by Cheryl Strayed, that I’d liked it and Oregon played a big part in it. He said he would. The cashier asked him, “Are you really going to read it?” He said, yeah, his girlfriend was reading it and he was going to read it when she was done. The cashier thought this was weird, that I’d recommend a book his girlfriend happened to be reading. We tried to explain why it wasn’t. It’s really popular, said the guy. Harry Potter popular. No, I said, because the cashier looked skeptical again, it’s Eat-Pray-Love popular. She seemed satisfied by this, asked me if I wanted my receipt, and we all moved out into our day. Wild was beginning to get Eat-Pray-Love popular even before Oprah picked it to jump-start her book club. After getting the big O on the cover, well, bestseller-dom was kind of a done deal. In the mid-90’s, Cheryl was in the midst of a divorce from a nice guy, dating another guy who’d introduced her to heroin, and still grieving her mother, who’d died a few years before. Standing in line at REI, she saw a travel guide about hiking the Pacific Coast Trail, and then decided that was a good way to start over. She systematically started planning the trip, sold her then-belongings for hiking gear, packed herself boxes of gear and money to meet her along the way, and went to California to hike up to Washington state. Wild is her memoir of hiking the trail, but also of the messed up things that happened beforehand that drove her to thinking it would be a good idea. She found out quickly it wasn’t. Twenty-something Cheryl is an often exasperating narrator, especially in her flashbacks to life prior to the hike. It’s easy to see why she wanted to run away. But it’s hard not to be engaged by her travelogue, one that includes snakes, bears and torturous boots. Modern-day Cheryl writes like a very balanced, serene person, intriguing to me since she says she didn’t have traditional experiences with therapy. She even has a gig as an advice columnist at The Rumpus; a collection of those columns, Tiny Beautiful Things, was recently published. For those of you who were exasperated by Eat Pray Love (which I have a theory about*), this is probably not your thing–immature narrator trying to find herself. Unlike that book, though, this doesn’t have a girl meets boy happy ending. It ends with girl confronting self and coming out the wiser for it having endured agony, both in life and on the trail. If that sounds fun, or if, like me, you like to read about adventures without actually going outdoors, then this is a page-turning read. *My theory about Eat Pray Love is that those who dislike it never went through a gruesome breakup. Non-statistically accurate testing has so far proved this true. The Dispreputable History of Frankie Landau-Banks by E. Lockhart had been on my to-read list for years and a recent resurgence in my reading of young-adult books bumped it to the top and oh, I’m glad it did. I, Frankie Landau-Banks, hereby confess that I was the sole mastermind behind the mal-doings of the Loyal Order of the Basset Hounds. I take full responsibility for the disruptions caused by the Order–including the Library Lady, the Doggies in the Window, the Night of a Thousand Dogs, the Canned Beet Rebellion, and the abduction of the Guppy. Frankie, who over the summer gained four inches and twenty pounds, all in the right places, is a sophomore at an expensive northeast prep school. She is suddenly surrounded by boys who want her attention, and enjoys it, all the while questioning whether it’s the kind of attention she wants. She makes a gradual but believable shift from nice girl in the dorm to criminal mastermind, and it’s a blast to make it with her. This is a novel that turns the romance on its head, while still taking time to appreciate some of it along the way. But it’s also a story of a girl coming into her own power, making the shift from sweet to bitter to bittersweet, and in that it reminded me of Veronica Mars. This is a fun fast read that yet has some nice heft to it.